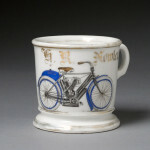 Motorcycles are a favorite of collectors and there really aren’t very many of them known to exist. Some of the most valuable are motorcycles that are not just generic images but detailed drawings of a specific brand or design, popular makers are of Indian, and Harley Davidson. 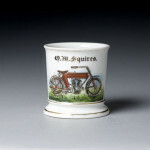 A Motorcycle shaving mug is a rare find and if you need help finding the value of yours please don’t hesitate to contact us for help.